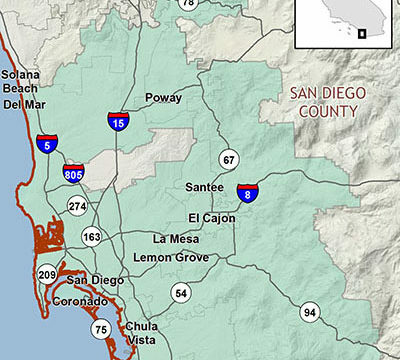 A South County nature preserve grew by 309 acres in 2017 and the county spent $2.2 million managing the existing 77,000-acre swath of land, according to an annual report received Wednesday by the Board of Supervisors. The South County Subarea is managed in conjunction with the Multiple Species Conservation Program: a collaborative federal, state and local planning project that seeks to balance biodiversity protection with building and development, agriculture and nature-based recreation. The county and public agency partners work to preserve habitat containing sensitive species so development may occur in areas of lesser biological importance. Land is regularly added and subtracted from the subarea, which includes more than 77,000 acres of protected habitat in the San Vicente, Flinn Springs and Otay Ranch areas, among others. Since the effort began in 1997, the county and its partners have assembled 79 percent of the preserve. The Multiple Species Conservation Program’s overall goal is to manage 98,379 acres of conservation land. Last year, the preserve grew by 309 acres, with the majority of that land, 242 acres, acquired by the county. Another 12 acres were acquired by the state or federal government, and 55 acres of private land was required to be donated as a condition of development. In 2017, $2.2 million was spent for management and monitoring of open space lands in the subarea. The county originally joined the Multiple Species Conservation Program in 1998. Officials are required to provide an annual report detailing habitat changes in the subarea.